The recent figures prepared by Oman National Center for Statistics showed interesting figures about the population in the Sultanate.  56% of the population are Omanis while 44% are expatriates. The population of Oman exceeded the 4 million mark on April 1, 2014, according to recent population statistics revealed by the National Centre for Statistics and Information (NCSI). As of April 2, the total population of Oman has reached 4,000,345. 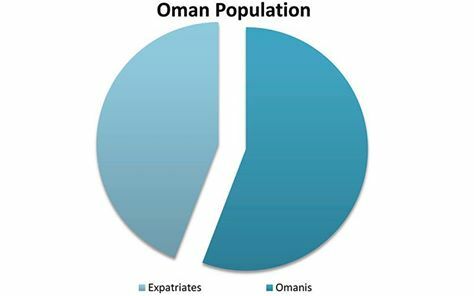 Omanis constitute 55.8 per cent of the population with 2,232,949 Omanis, while expatriates comprise 44.2 per cent of the total population with 1,767,396 expatriates in the Sultanate. Comparing these figures with those issued at the end of December 2013, the number of Omanis has increased by 20,256 in the first quarter of 2014, while expatriate numbers increased by 23,049 during the same period. In detail, the figures show that Omani males outnumber females in the country. The total number of males stood at 1,130,115, while the number of females hit 1,102,834. For the expatriate population, the number of males is higher than females, with 1,448,816 males versus 318,580 females. The Governorate of Muscat recorded the highest percentage of expatriates which stood at 62 per cent of the total population of the governorate by the end of March 2014, while Omanis comprised 38 per cent of the residents. In Al Dakhiliyah the ratio of Omanis is 77 per cent compared to 23 per cent expatriates of the population. In Al Batinah Governorate, the ratio of Omanis stood at 75 per cent against 25 per cent expatriate population. The ratio of the local versus expat population in other parts of the Sultanate varied between Al Dakhiliyah’s and Muscat’s figures. This entry was posted in Uncategorized and tagged expats in Oman, foreigners in Muscat, Oman demography, Oman population. Bookmark the permalink.